Bridge protection systems are critical to the preservation of bridge structures and the avoidance of critical shutdowns. Brennan can facilitate the construction and repair of several types of structures to protect bridges located in navigable waterways. This includes timber cribbing, steel protection cells, and fender systems. In all cases, Brennan can remove the damaged or degraded structure; and install a new one without impeding traffic over the bridge. Thank you for interest in our bridge construction services. For more information on Brennan, download our marine construction brochure. 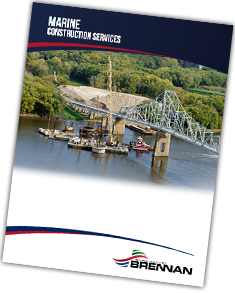 Want more information on our bridge construction services? Fill out the form below!